Solera Quartet Releases Debut Album on September 25, 2018 | Kirshbaum Associates Inc. 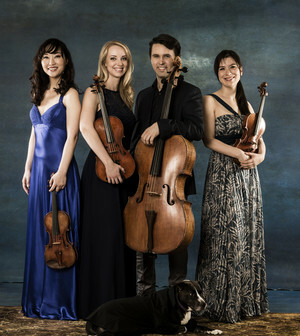 The Solera Quartet, embarking on its fourth season, has already accumulated a remarkable and unique list of accolades, garnered for their fiery musical expression, poetic sensibility, entrepreneurial acumen, and exceptional dedication to outreach initiatives. Celebrating this banner year, the Solera Quartet’s debut album, Every Moment Present is due for release on September 25th, 2018. Comprised of three poignant string quartets by Mendelssohn, Janáček, and Caroline Shaw, the album explores the role of obsessive thought as creative muse. I-IV: Leoš Janáček: String Quartet No. 2 "Intimate Letters"
Future recordings include a multi-album project for Naxos slated for 2019, exploring the chamber music of George Enescu with pianist Josu de Solaun, First-Prize winner of the XIII George Enescu International Competition. In the spirit of these values, the Solera Quartet has a dedicated vein for outreach initiatives, striving for new ways to improve the lives of others through music and artistic engagement. At the invitation of the non-profit organization Project: Music Heals Us, founded by Solera Quartet violist, Molly Carr, the Quartet performed its first concert in a Connecticut prison in the spring of 2016. Inspired by this transformative experience, the Quartet shortly thereafter developed, designed, and implemented Project: Music Heals Us’ Prison Residency Project, organizing visits and short-term residencies in correctional facilities nationwide, in order to bring live performance, meaningful discussion, and participatory workshops to incarcerated communities, and encourage a spirit of understanding, collaboration between artist and inmate, and stimulation of intellectual conversation. In January 2018, the Solera Quartet launched the Prison Residency Project’s pilot Musical Immersion program with the Danbury Federal Correctional Institution, using funds from the Quartet’s Pro Musicis International Award, for a weeklong residency focused on the music, history, and impact of Beethoven, during which they offered an innovative composer’s workshop available to inmates of any, or no, musical background. Working together with incarcerated individuals, most of whom did not read music, the Solera Quartet utilized innovative and unconventional means of helping the inmates develop their compositions by intuiting their musical intentions through gestures, markings, and words, bringing the inmates the benefits of creative expression, as well as the unique opportunity to truly collaborate with world-class artists. In response to these initiatives, the Solera Quartet has been honored with the 2018 Guarneri String Quartet Residency, funded by the Sewell Family Foundation, under the auspices of the Chamber Music America Residency Partnership Program, to develop future residencies with correctional facilities across the nation.